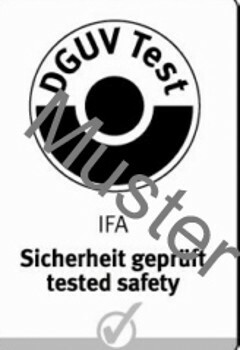 As one of the test bodies in the framework of the DGUV Test, IFA awards the DGUV Test-mark for ready-for-use test and work equipment, safety-relevant components and groups of components and sub-aspects of work equipment once these meet the safety and health requirements currently valid in the Federal Republic of Germany and as long as only products that correspond to the type are brought onto the market. As a control measure, the manufacturer can select between random sampling and examination, certification, and monitoring of its quality management system conducted by the test body. Ready-for-use test and work equipment includes instruments (direct-indicating measurement systems: detector tubes and electronic measurement systems) and sampling equipment (pumped samplers and diffusive samplers employing activated charcoal and silica gel) for determining hazardous substance concentrations at workplaces. Components such as position switches, emergency shut-off controls, locked safety covers, flexible hoses, valves, and quick-release safety couplings. The sub-aspects encompass printer and photocopier toners marked "low-emission". IFA certifies floor coverings and grilles in the field of architectural safety elements. The DGUV Test-mark for floor covering also includes information on the material's slip-retarding properties. Ladders, steps, step irons, loading ramps and gates are tested on behalf of the "Trade and logistics" expert committee, "Constructional facilities and trade" subcommittee. Cooperation also takes place with the Building construction sub-committee of the Construction expert committee regarding scaffolds, safety nets and other temporary equipment on construction sites, and also wall, roof and floor elements. This activity particularly concerns safe accesses and workplaces (sites) with collective protective equipment against falls from a height. DGUV Test-marks are also awarded for several basic materials of personal protective equipment, such as reflecting materials for warning colour clothing.